I’ve written before here about how the Apple Smart Cover and an ultra-thin Gelaskin were my favorite outfit for the iPad 2. As of just a few minutes ago, that is now the new (and favorite) setup for my new iPad as well. 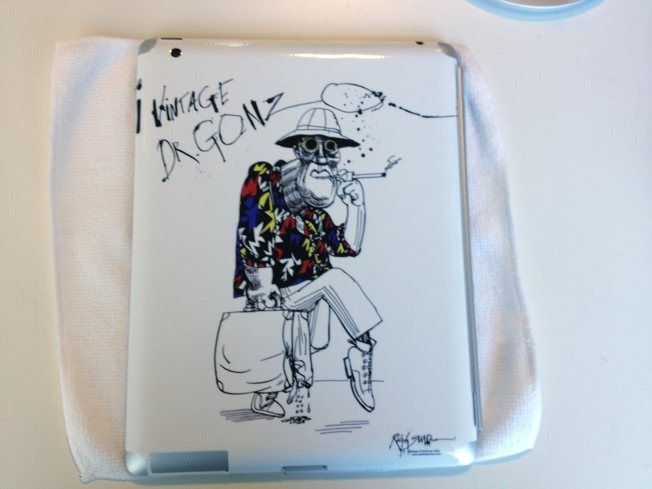 I’ve just installed a new Gelaskin – my favorite Dr. Gonzo – on my new iPad. Gelaskins are so light that they feel like they add nothing at all to the weight of the iPad, while still providing a little bit of minimal coverage to the back of the iPad. They come in a large range of unique and striking designs. I love the Dr. Gonzo skin because it’s not as busy as some of the others and also because I’m a big fan of the artist, Ralph Steadman, and the books that Gonzo is a character in. Another advantage of Gelaskins is that they are so thin that most back cover type cases will still fit with one of them on. Gelaskins for the new iPad and iPad 2 go for $29.95. You can browse the range and place an order at the Gelaskins page for them. This is so cool, definitely keeping an eye on it as I’m a Johnny Depp fan. Would be nice if they considered a Tardis Cover for the iPad 3. I just got my River Song Diary Ipad Cover from http://www.joevleather.com but would also like one in this style.